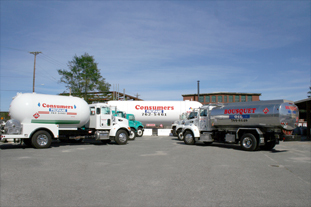 Bousquet Oil is a full service, family owned and operated environmentally sensitive oil company providing products and services of the highest quality to our Northern Rhode Island and Southeastern Massachusetts customers. Our fleet of oil delivery trucks will provide an ample supply of heating oil to your home or business. In fact, with Bousquet Oil’s automatic delivery service, you will never have to worry about heating your home. Our ability to exceed our customers’ expectations by our caring and committed staff, has earned us the reputation of being the best in our business! We are dedicated to maintaining the personal touch and quality care only a local family run business can provide. Our mission is to be a premiere home fuel supplier, provide expert service, and meet the needs of our customers at a fair and competitive price. Please contact us for any of your oil heating needs. Our friendly and knowledgeable customer service representatives will set up an appointment to discuss the oil options available to you. This is a one year contract that covers parts and labor pertaining to oil burner service; emergency night and week­end service, annual cleaning and tune-up consisting of replacement of nozzle and oil filter; adjusting burner controls; inspecting the interior and removing any soot by vacuum or chemical procedures. The BASIC Plan does not cover any water related parts, water leaks or water heaters. **Parts not covered by service contracts are subject to a labor charge.